If you want your outdoor kitchen looking this nice come spring, give it some attention this winter. Even if you didn’t get around to it before the busy holiday season, it’s not too late to prep your outdoor kitchen for the cold weather still ahead. Spring isn’t here for another three months, so any maintenance done now will help your outdoor kitchen last the rest of the season and be ready to go by the time the weather starts heating up. Your outdoor plumbing is probably the most susceptible to damage during the winter time, so it’s vital you clear out the pipes. In order to do this, first shut of the water supply to your outdoor kitchen from inside your home. Once the supply is off, drain water from each and every line. This doesn’t just mean the sink, any water line you may have going to a fridge or ice maker needs to be cleared too. There’s nothing saying you can use your grill during the winter, but it’s always better to give a deep clean while the sun is shining and the weather’s still warm. Make sure you clean every surface before covering the grill with a manufacturer specific cover. Any type of countertop can take a beating during the colder months, no matter the material it’s made out of. 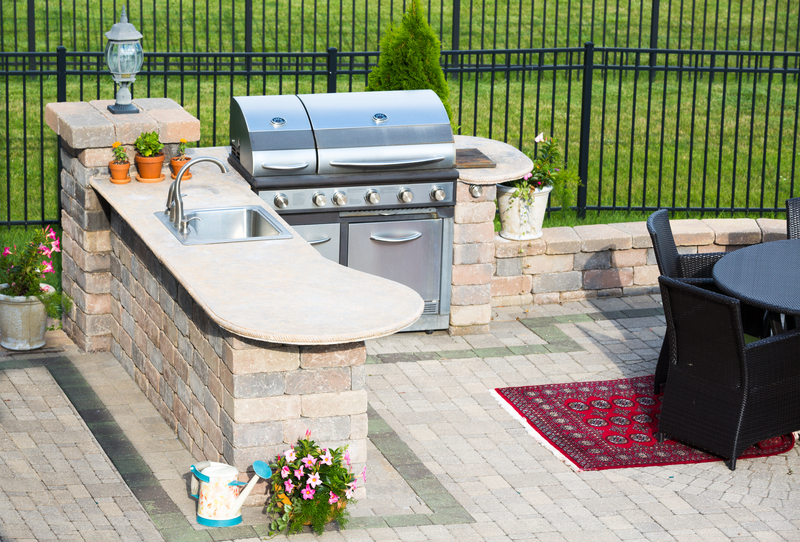 A great way to protect an outdoor countertop is with a cover, but you need to make sure moisture isn’t getting caught between the surface and the cover. For materials like stainless steel, natural wood, or outdoor stone, use an appropriate sealant to ensure your counters and cabinets are protected. Even before you drain the water lines to your fridge, cut off the power and give it a good cleaning. Since refrigerators are, obviously, made to keep cold, they will hold up the best to the winter temperatures. The biggest concerns are making sure the electricity and water supplies have been shut down for the season.